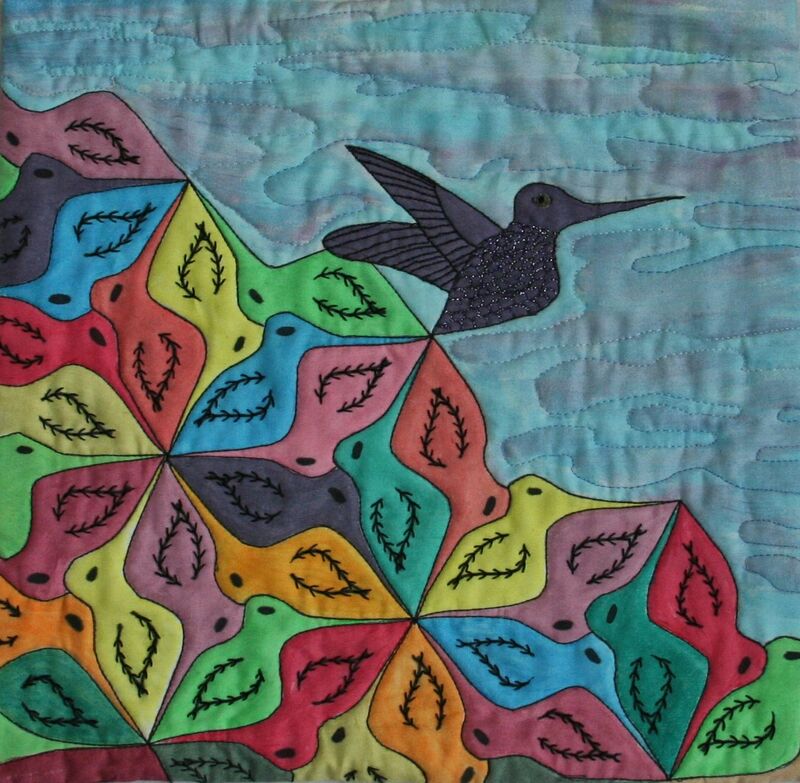 This is going to be a long post as I’m going to share the step-by-step creation of my latest small art quilt – First in Flight with all of you. 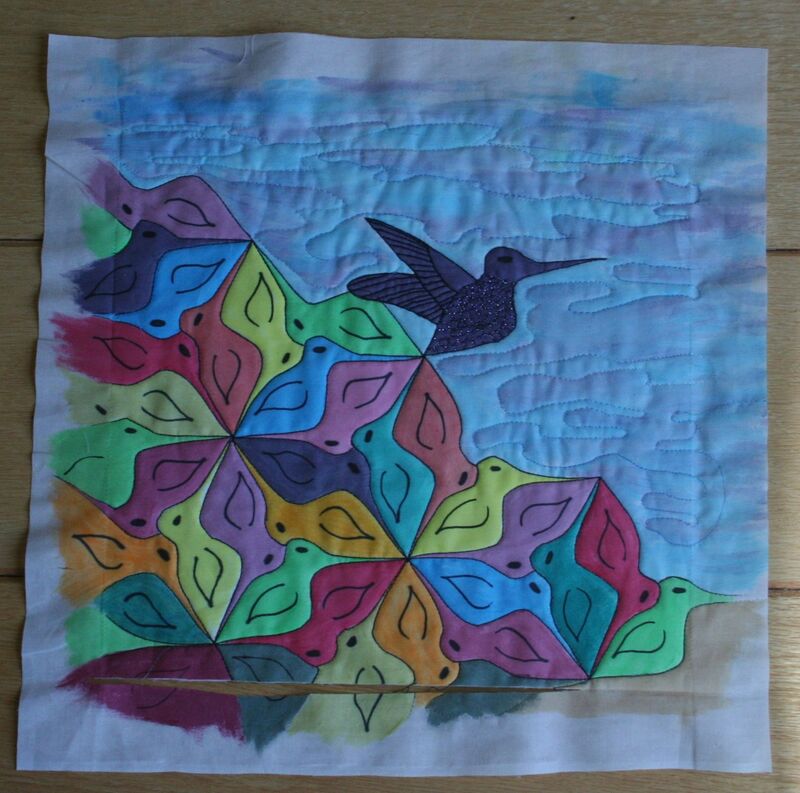 It all started with a Fiberista’s Art Group challenge. All the members take a turn presenting a program to the group, and we are supposed to make something from the new techniques we learn. 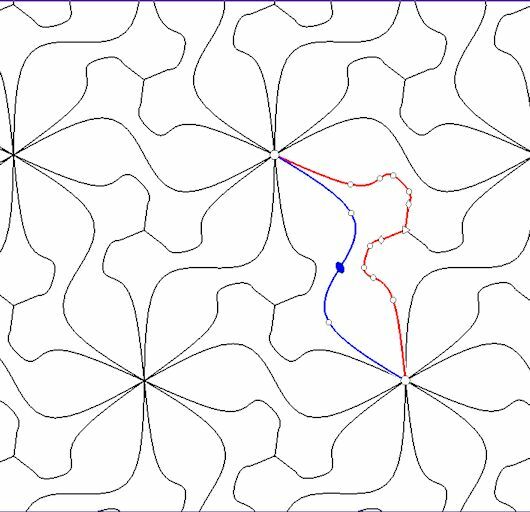 Sue’s April technique was learning how to create original tesselations with the help of a new software program from TesselManiac. It was a big hit and we all purchased the program. I smoothed out the curves, added a small design in the body to give the illusion of a wing, and added a black eye in the head area, then traced the bird onto tracing paper over and over to get an arrangement I liked. Once the paper tracing pattern was completed, I placed a piece of 400M pfd fabric on top, and traced the design onto the fabric with a Sharpie. The names of the inks are on the left, the number of drops used is along the bottom, and the inks used were Liquitex professional acrylic ink, Daler Rowney FW acrylic artist inks, and Adirondack Alcohol inks. As you can see, you can create values by adding more drops of ink. The little hatch-like marks at the upper left top were made with Derwent Inktense ink pencils, and I used them for a couple of the birds also. This was a bit like painting by numbers. I stayed inside the line, painted on dry fabric, and mixed and matched the 4 colors I used in little plastic containers to create lots of variations. The sky was painted the same way, but with a larger brush, broad strokes, and 4 different colors. 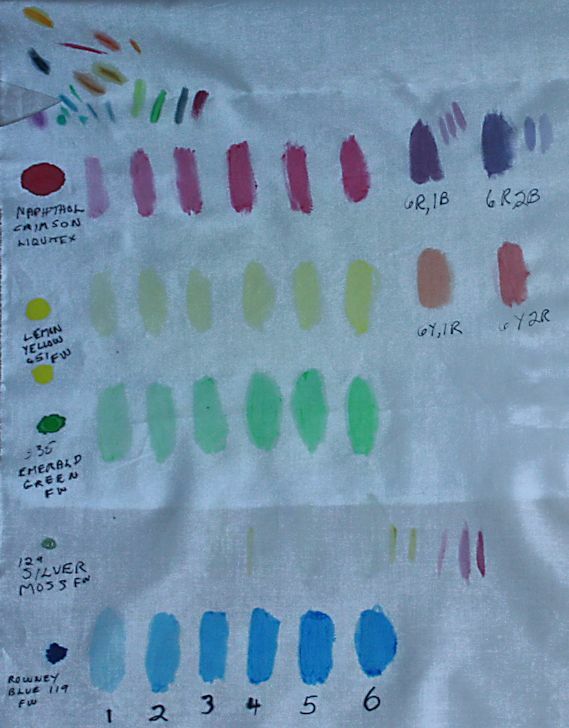 The fabric was air dried for a couple of days, then ironed, then I gently washed the top to remove the Aloe Vera gel. The hand of the fabric was soft and supple, but the yellow bled a bit. I would not use this technique for something that had to be washed a lot, but it was perfect for this little art quilt. Next it was quilted, and the bird taking off for its first flight was embellished with lots of metallic embroidery threads, and opening wings. The eye is a sequin with a French knot holding it in place. Yes, that is a wonky slit across most of the bottom that is supposed to be the quilt edge. My reaction? I put my hands on either side of my face and repeatedly and sadly said “Oh my.” Now this is not normal behavior for me. I can be pretty emotional and have been known to swear, but I was really tired – which is probably why I didn’t think to turn the quilt over, and cut the batting and backing fabric from the back – like I normally do for this technique. I quietly left the room, went downstairs to eat lunch, and didn’t go back into my sewing studio till the next day. I looked at it, did a little heavy sighing, and left the room again for another 24 hours. After considering several options, I simply whacked off the entire bottom edge, sewed a seam, and carefully, and I mean carefully, understitched the hem by hand so it would perfectly turn along the bottom edge. It came out great. It came out so great, I decided the quilt had been saved and was worthy of some hand embroidery. Each and every little bird’s wing was hand embroidered with 2 strands of embroidery floss and – get this – with THE FLY STITCH !!! Pun intended. I loved making this little quilt – even with the “Oh my” incident, but sure hope I don’t have an “Oh my” experience with my next creation.